To prevent Ransomware attack,Cyber-criminals recently nicked thousands of computers across hundreds of countries demanding Bitcoins in exchange. Such was the attack that it left patients across England waiting for healthcare, and disrupted public utilities in Spain. Ransomware is a malicious software, often transmitted by email or web pop-ups, that hijacks a computer and demands a ransom for release. Scareware: This is the safest and least lethal of all the ransomware. 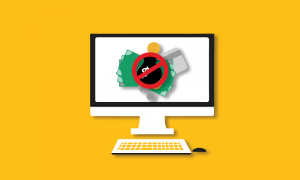 The affected computer will show a pop-up message claiming that malware was discovered and the only way to get rid of them is by paying the said amount. If you do nothing, you will keep getting these pop-ups, but your files are safe. A quick scan from your security software should be able to clear this out. A Scareware attack is more irritating than costly. Screen Lockers: This is a more lethal attack that first targets your computer and then you. Typically, it will freeze your computer to show a screen with a government agency logo stating malicious activities was noted from your computer and you have been asked to pay a certain “fine” to unlock your computer. No government agency or Internet Service Provider (ISP) will do that unless you have done anything illegal. Even if you have, these parties take a legitimate action and do not freeze your computer. You will need a system restore or a hard scan to retrieve your files. Encrypting Ransomware: This is the most lethal one and this created a lot of buzz a couple of weeks ago. This software encrypts all your data and is un-retrievable unless you have paid the ransom. There is nothing you can do and paying the ransom does not necessarily ensure your files’ safety. Update software: Software providers are constantly upgrading their products and ensuring regular updates will help you ensure ransomware safety. Train your staff: Cyber-security is everyone’s responsibility. Your staff must know how to identify and be aware of malicious content. Filter .EXE in emails: Organizations often share executable files in emails. You never know who may send a bad file. Add filters to your emails run .exe files only after scanning them. Disable Remote Desktop Protocols (RDP): If you do not require the use of RDP, you can disable RDP to protect your machine from Filecoder and other RDP exploits.